On the left sidebar in your WordPress dashboard click Modules » Add new. Select the type of module you want to use from a variety of module types. Fill in the Title as you always do with regular posts. 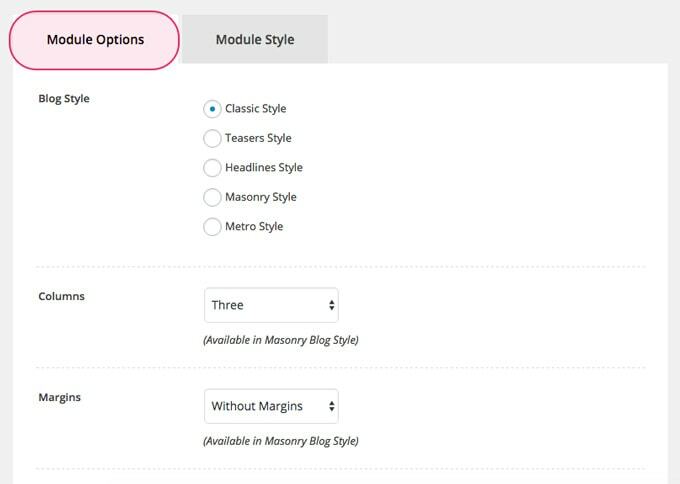 Each module comes with its own layout, content and style settings. Will it have a background? A special header? What about some neat colors? How many columns for this stunning portfolio module? Once you have your module ready, click Publish. Then you’ll be able to insert the module in any page or pages that use the Modular Page template. Click “Add this Module to a Page” and drag it and place it in the order you want. Remember to click “Save page” after you select the desired modular page. Modules you create can be used all over the site anytime by adding them to all the pages you want. And you can also quickly duplicate it, make your changes and move forward.